Having your own car gives you limitless freedom, but if you are part of a growing family, opting for a singular family car may be the best option. Here we tell you how you can adapt to life in your new vehicle while also keeping the entire family happy. A family car is an excellent long-term investment for many reasons, but its most profound benefit is that will ultimately save you money. If you and your partner currently own one car each, this means you are paying twice as much for insurance, road tax and maintenance than necessary. Opting for a family car will half this financial burden, and the money you save can go towards family holidays, home improvements or even just for a rainy day. Another benefit of a family car is, of course, the increased about of time you get to spend with each other. As your children grow older, you may find the time you get to spend with them is limited, but a family car can easily change this. By turning each car journey into a small family road trip, you will spend a lot of time with each other and bond as a family. As well as saving money and creating more family time, a family car will also help the environment. Having only one car means you are reducing your carbon footprint and minimising the amount of carbon dioxide and other greenhouse gases emitted into the atmosphere. As you can see, the hatchback style is a very popular choice for family cars. In terms of practicality, hatchbacks are hard to beat due to their impressive spacious interior and high level of comfort. Although hatchbacks are the most popular choice, you must take into consideration your requirements and, of course, genuinely like the car you buy. Although practicality is important, you must understand that buying a family car does not mean you need to compromise style and sophistication. A MINI Paceman or Clubman are ideal choices for a family car as they are spacious as well as being aesthetically pleasing. As a reputable car brand, you will also find these MINI cars will not be problematic, which is essential when you have a family to take into consideration. However, if you find your MINI is damaged or faulty in any way, MINI Repairs in Buckingham will be able to assist you. Sharing a car can be quite tricky if you are not organised and do not communicate effectively with your partner. Similarly, extensive planning is necessary for a stress-free car sharing experience. Many car journeys need to be made on a regular daily basis, such as the school run, getting you and your partner to work, after-school activities, doctors/dentist appointments and visiting family/friends. Such a busy lifestyle means timing is crucial and the importance of planning where you and your family need to be on what day and at what time cannot be understated. Your child’s safety is of high importance, so implementing safety precautions in your vehicle is necessary. One of the most obvious safety features you should utilise is a child lock. In newer car models, the child lock can be engaged electronically from the driver’s control panel, but generally, it can be activated using a switch on the edge of the rear door. This switch can only be accessed when the door has been opened. Once activated, it will now be impossible for your children to open the door from the inside. 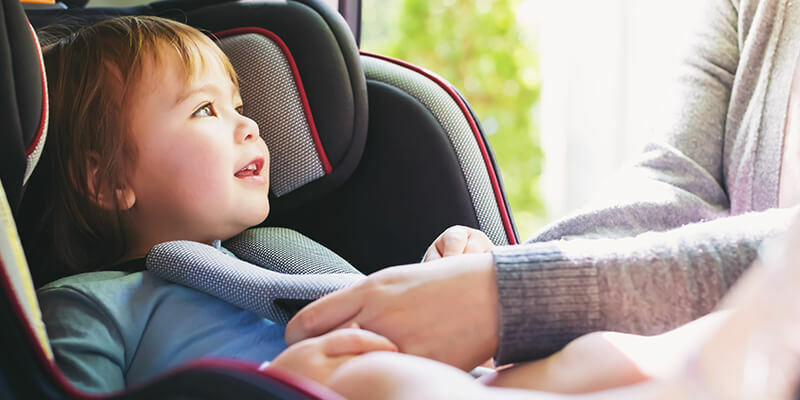 The law states that any child travelling in the front or rear seat of a vehicle must use an appropriate car seat until they are 135cm or 12 years old. For this reason, if any of your children are under 12 years old or below 135cm, you must invest in a car seat. This car seat must be in the correct category for their age and size and meet EU standards. If you are unsure of what car seat your child needs, Which? have a beneficial article which explains in depth the various car seat categories. Another feature which you should consider using in your family car is a window shade. This will keep your children protected from harsh UV rays and reduce heat in the car. Window shades are super budget-friendly and are an excellent way of keeping your little ones comfortable on hot and sunny days. For those long journeys, you will want to invest in products that will keep your children entertained. A portable in-car DVD player is a family car favourite for many reasons. These DVD players can be attached to the back of the front seat headrests, creating an ideal viewing position for rear seat passengers. Another benefit of in-car DVD players is that they can be linked to play the same movie on both screens or used independently. A Nintendo DS is also very popular with young children as they can stay entertained for hours playing various games. If you have young children, you will be fully aware of how messy things can get, and your car will be no exception. Apart from getting your car’s interior and exterior cleaned regularly, there are other ways you can keep your vehicle neat and tidy. A back seat organiser consists of various storage pockets and drinks holders which your children can use to store their snacks, electronic devices or toys. Initially, the thought of a family car being your primary form of transportation may seem daunting, but will ultimately benefit the entire family. With the correct amount of planning and organisation, adapting to life in your family car will be simple, and you’ll wish you had done it sooner.